Antonio Jenkins awaits pitch in bottom of the fourth. Thursday night featured a battle between two undefeated squads atop of 7A District 8 and it surely did not disappoint. Taking to the mound for the visiting King Lions was righty Luke Drummond, who opposed righty Aaron Bonanno for the home team, Hillsborough Terriers. Both teams shot out of a cannon to start the game, totaling 13 runs through the first four innings before Terriers pitching took control and preserved the 7-6 victory to remain undefeated. The Lions (3-1, 1-1) were dialed in early on and took advantage of some defensive miscues by the Terriers. Center fielder SeyJuan Lawrence led off the top of the first and took a 3-2 pitch from Bonanno and sent it into the outfield for a base hit. One batter later, Lawrence took off for second and made it in safely to put himself in scoring position. 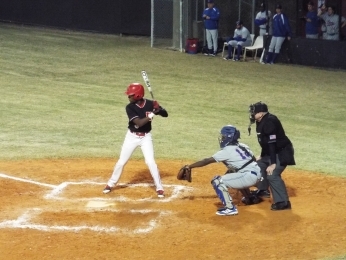 His efforts paid off when Jamarcus Lyons put the ball in play and an error allowed Lawrence to round third and come home for the first run of the inning. With two outs, right fielder Kobe Barnum saw a pitch he liked and hit a hard line drive into center field to bring home Lyons for a 2-0 advantage. Despite falling into a deficit in the early stages of the game, Hillsborough manager Kenny White says he never doubted they could get back into the game. The Terriers (4-0, 1-0) quickly matched the two runs with two runs of their own in the bottom of the first inning. Shortstop Rodnie Renardo got things going with a base hit and advanced to second on a successful steal attempt. Renardo moved to third on a base hit by Tim Elko and both were brought home by a hard line drive hit by third baseman Nick Romano. It was just the start of a big day for Elko, who was 3-for-4 with an RBI. After a scoreless second inning from both sides, the Terriers quickly saw themselves in a 6-2 hole following a four-run top of the third inning from the Lions that saw them chase the starting pitcher. The highlight of the inning came off the bat of left fielder Justice Thompson, who sent a blistering line drive into deep center field that placed him at third and a run across the plate. Thompson later scored to help bring his teams lead to four. Despise falling behind four runs, the confidence and swagger of the Terriers teams never wavered. Pitcher Luke Drummond leans in for the sign. The Terriers were able to get back two of the runs in the bottom of the third. Rodnie Renardo scored on a double by Elko, one of his three hits on the night. Antonio Jenkins lead off the bottom of the fourth by sending a 1-1 pitch into the outfield for a double. The next batter, Ryan Romano, reached base on an infield hit to put runners at first and second. Still down by two, Renardo bunts the ball into play and errors by the Lions infield allow him to reach base safely and allows Jenkins and Romano to score to tie the game. Bernard would later come around to score the go-ahead run on a wild pitch. Now with a one-run lead, the Terriers brought in pitcher Jarrod Cande and he put an end to any hope for a Lions comeback. Cande threw 53 pitches over three and two-third innings, allowing just one hit and striking out six to preserve the win. 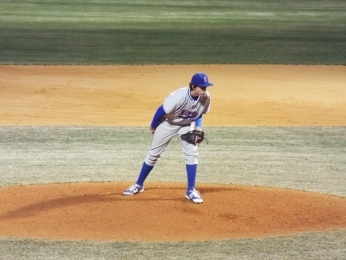 When the final pitch was thrown, the Terriers’ players knew how important of a win it was within the district.